There’s a picture of Lake Ohrid (Ohrid, Macedonia/FYROM). Usually you are supposed to see the mountains over the Albanian border, but as it started snowing that day (January 3rd, 2009), it was totally foggy. It’s not very common to have snow in Ohrid, according to people we talked to the time when it snowed last time ranged between three or ten years. 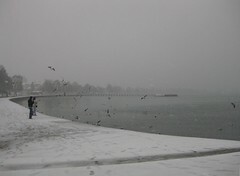 But it was a very calm and relaxed atmosphere, the birds with their cries, the sound of the water, and not much more. This entry was posted on Mittwoch, Februar 3rd, 2010 at 20:00 and is filed under Uncategorized. You can follow any responses to this entry through the RSS 2.0 feed. You can leave a response, or trackback from your own site.